How can I upload the slider project files to Internet/online via FTP? 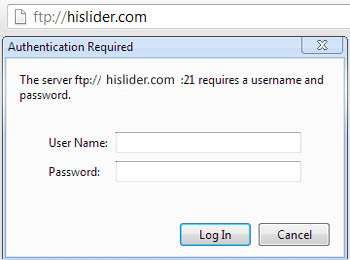 "I haved finished the slider project at my computer, and how can I upload the the online server via FTP?" FTP (File Transfer Protocol) is a widely used method to upload files to and download files from Internet. But before you can upload your files to your domain, you'll need a FTP username and password for you domain manager. You can use FTP to upload your files to your server in two ways: web browser and FTP software. 4. You may probably see a blank window. But soon you will be directed to the FTP server. Then you just need to drag and drop you files into the browser window to the correct directory. This may take some time. Once you finish uploading, the icon of the file will appear in the Internet Explorer window.